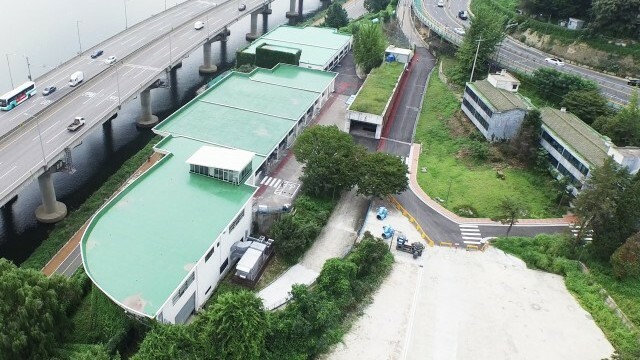 1 of 4 Seoul Street Arts Creation Centre, Water Intake Station. Photo © Yongsuk Choi. Courtesy of Seoul Foundation for Arts and Culture. Seoul Street Arts Creation Centre, Water Intake Station. Photo © Yongsuk Choi. Courtesy of Seoul Foundation for Arts and Culture. 2 of 4 Seoul Street Arts Creation Centre, Equipment Hatch. Courtesy of Seoul Foundation for Arts and Culture. Seoul Street Arts Creation Centre, Equipment Hatch. Courtesy of Seoul Foundation for Arts and Culture. 3 of 4 Seoul Street Arts Creation Centre, Courtyard of Water Intake Station. Courtesy of Seoul Foundation for Arts and Culture. Seoul Street Arts Creation Centre, Courtyard of Water Intake Station. 4 of 4 Complete view of Seoul Street Arts Creation Centre. Courtesy of Seoul Foundation for Arts and Culture. Complete view of Seoul Street Arts Creation Centre. Seoul has a limited and regionally unbalanced cultural infrastructure, which makes it difficult for the city to sustain a lively cultural life. There is a growing demand for arts and culture facilities from local residents in the north-eastern part of Seoul. Artists in less popular genres face the most severe shortage of cultural infrastructure. In particular, there is a lack of technical workshops and rehearsal spaces suitable for street arts. The Seoul Street Arts Creation Centre is a creative space which supports street arts and circus projects, and provides education for the artists in these fields. Work created in and supported by the centre will have a higher chance of being presented and shared at cultural events such as city festivals. The centre is designed not only to support professional artists, but also to raise public awareness of these art forms and provide the opportunity for new cultural experiences. It will serve as a base for exchanges at home and abroad as Korea’s first – and Asia’s only – specialised creation centre for street arts and circus. It is a project of the Seoul Metropolitan Government, with planning and operations delegated to the Seoul Foundation for Arts and Culture. 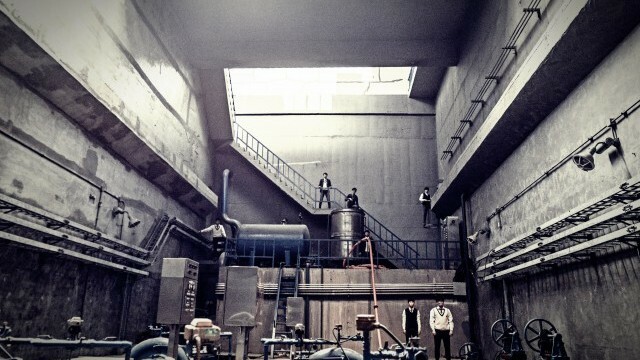 The Seoul Street Arts Creation Centre is located in the former Guui Water Intake Station complex, a valuable piece of modern cultural heritage. When it was decommissioned after the construction of a new water intake station, the idea was born to turn it into a new cultural space while preserving its industrial heritage. It was an ideal space for both street arts and circus, providing a large, high-ceilinged space (the equivalent of two stories) for practicing and performing circus routines, as well as a large outdoor space for street arts. The project began in 2012, with an inquiry into the Guui Water Intake Station site. In 2013 there was a open-studio event which tested the suitability of the buildings and site for use as a venue for street arts and circus. After renovation, the site opened as the Seoul Street Arts Creation Centre in 2015. The centre now has two main spaces. The former Water intake station 1 has a large main hall and an area devoted to set production. Water intake station 2 has a practice room and a video production room. There is also a large outdoor space that is available for practice of outdoor performances. Since its opening, the Seoul Street Arts Creation Centre has been active. More than 20 street arts groups received project and production funding, and more than 30 street artists participated in a professional development programme. It has produced more than 50 circus artists, run an academic programme, and supported the creation of a group programme. It also ran an art class in which about 300 elementary students participated. The Seoul Street Arts Creation Center is still a work in progress. There is still space that requires renovation: a former water chlorination building is being turned into a set production space, and a space for artist residencies is also being created. New projects are currently being considered in consultation with the artists and experts who are served by the centre. This is moving forward at an intentionally slow speed, avoiding a trial-and-error approach by allowing time for research and planning. • The centre failed to secure sufficient funding in a budget examination process. Due to this lack of funding, some of the centre’s facilities were not complete when the centre opened, leading to complaints from artists. Having a secured budget and a smoothly-running administrative system must be priorities in order to meet the needs of artists. • More work needs to be put into explaining the public benefit of the centre. Public understanding is necessary for cultural projects to be successful, but the centre’s vision of promoting street arts and circus is not yet widely understood or supported in Seoul.